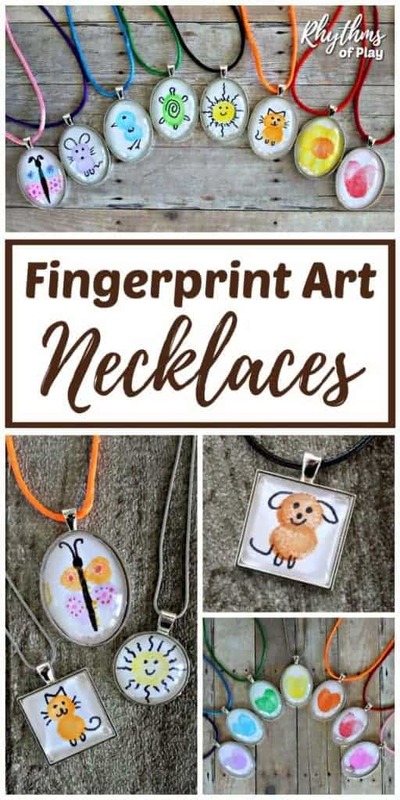 Gather the fingerprint and thumbprint art jewelry craft supplies that you would like to use below and follow the step by step directions to make your own artwork jewelry. Gather the following simple supplies to make your own unique handmade artwork jewelry. 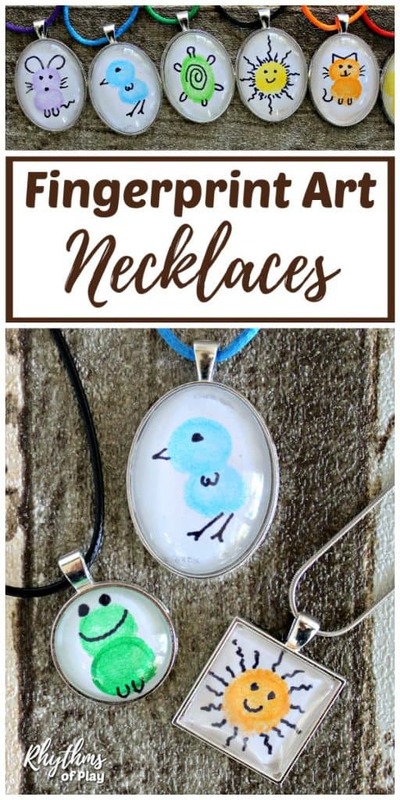 Use the tutorial below to make fingerprint art necklaces, or learn how to make fingerprint art keychains and backpack charms! 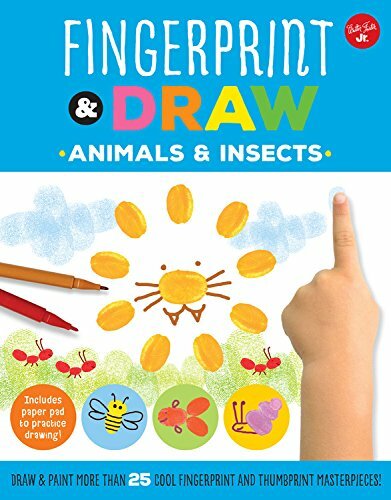 First, invite children to create art using any of the fun ideas below. 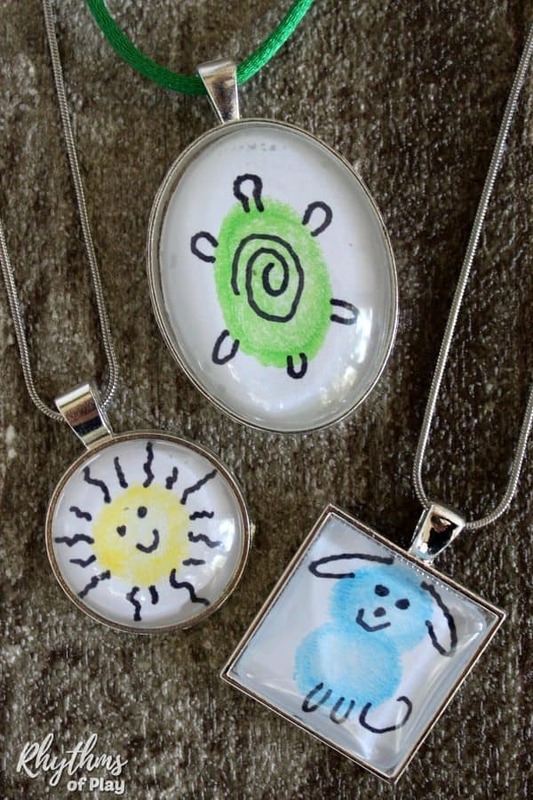 Next, have the kids turn their artwork into necklaces, keychains or backpack charms. 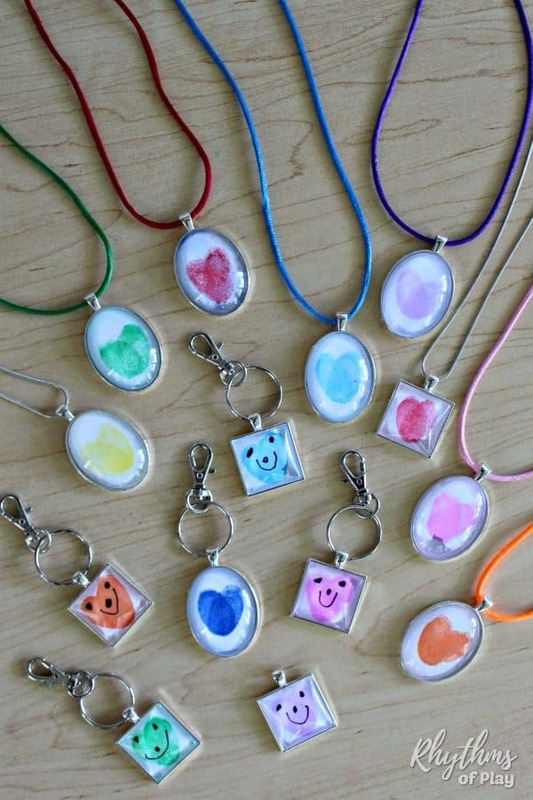 Have children use their thumbs to make hearts to make thumbprint heart necklaces. Another fun idea is to make thumbprint heart keychains. Click on the links for the step by step tutorials. 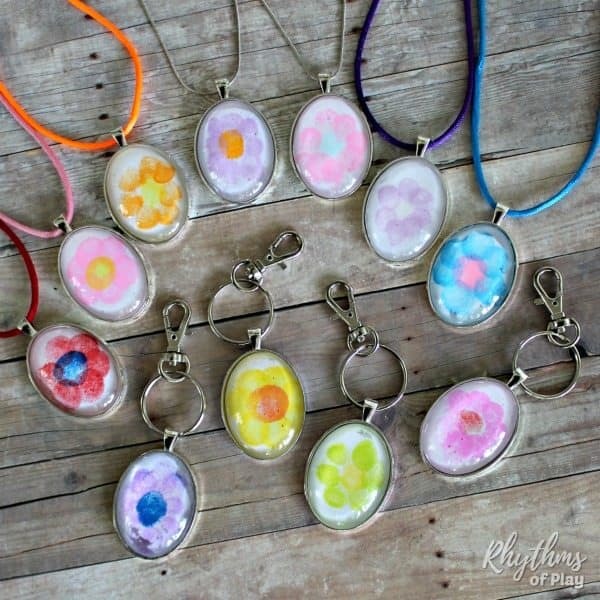 Invite the kids to create flowers using their fingertips to make fingerprint flower necklaces (or keychains). Click on the link to for the directions to make this simple keepsake craft. 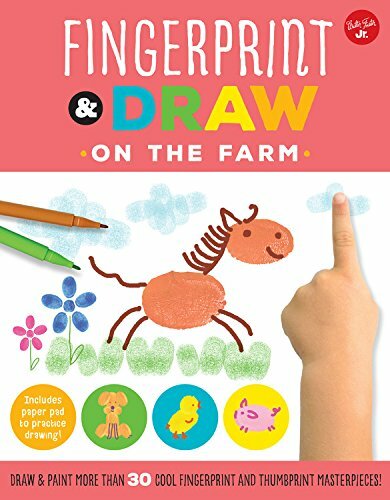 There are so many fun ways to create art with fingertips and thumbs! 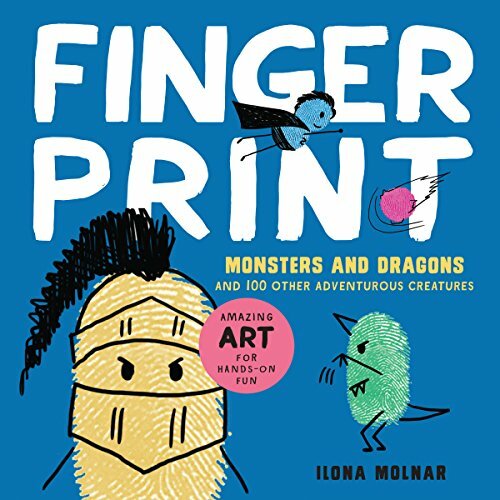 My daughter and I have made lots of fingerprint art for fingerprint art necklaces and fingerprint art glass magnets! 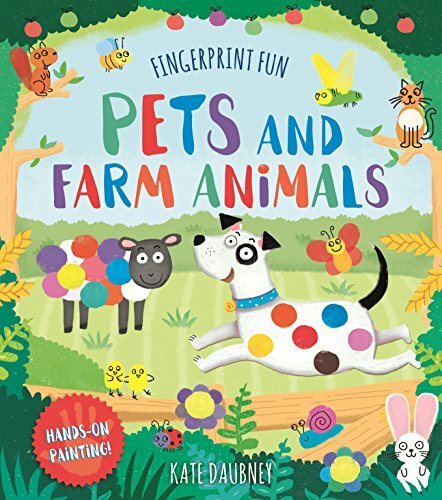 We have had a wonderful time together trying the ideas in the books below and making fingerprint and thumbprint art using these finger ink pads and a black permanent marker with a fine tip. 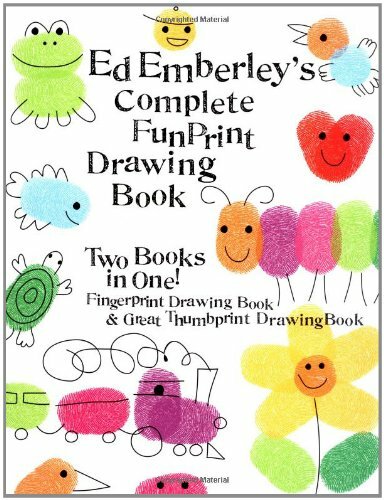 My daughter and I particularly enjoyed Ed Emberley’s Complete Funprint Drawing Book. 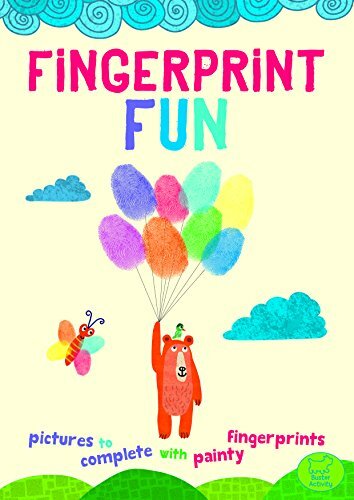 It contains two of his most popular fingerprint art and thumbprint art books combined into one awesome fingerprint art book for kids. 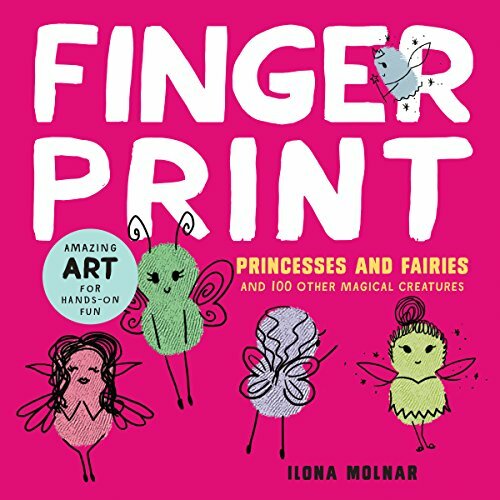 We also loved the Fingerprint Princesses and Fairies book. 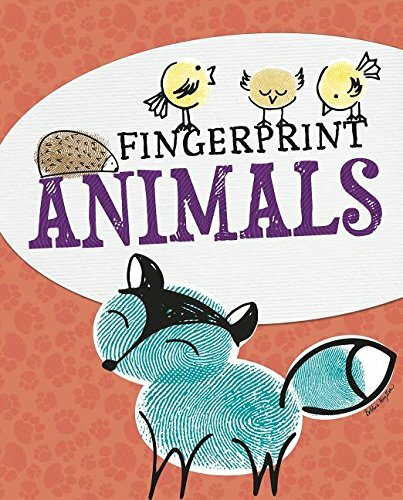 Have the kids find inspiration to create their own fingerprint art using the ideas in the books below. 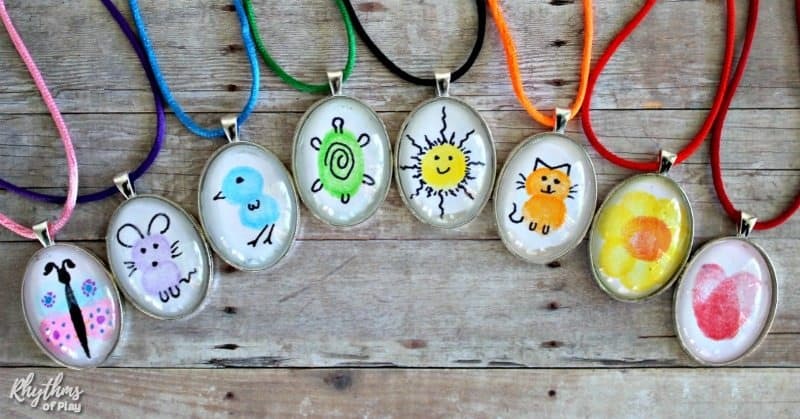 Watch the video to see how easy it is to make fingerprint art necklaces. In the video, my daughter demonstrates how to make fingerprint butterflies magical with gel pens. The video also shows how easy it is to use the same pendants to make keychain and backpack charms. Step by step written directions for DIY art necklaces can be found below the video tutorial. Another fun idea is a DIY photo necklace or photo keychain pendant. Click on the links for the step by step directions! 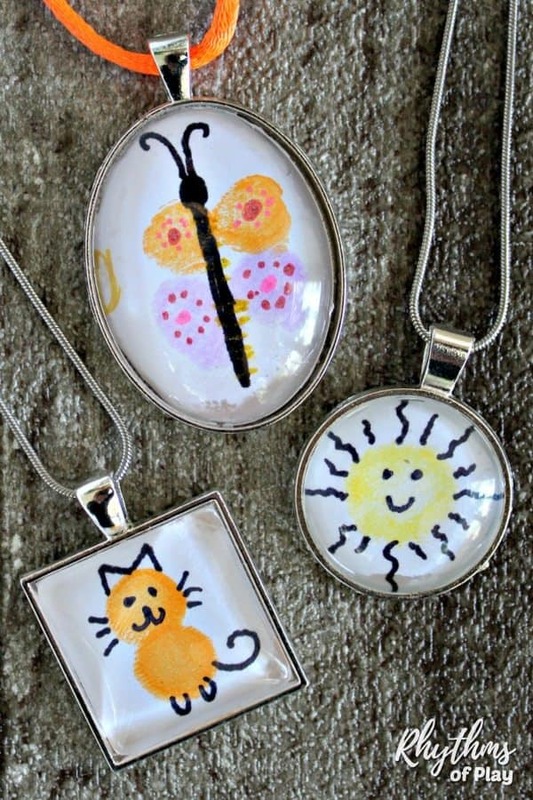 Follow the easy DIY directions below to make your own fingerprint art jewelry! 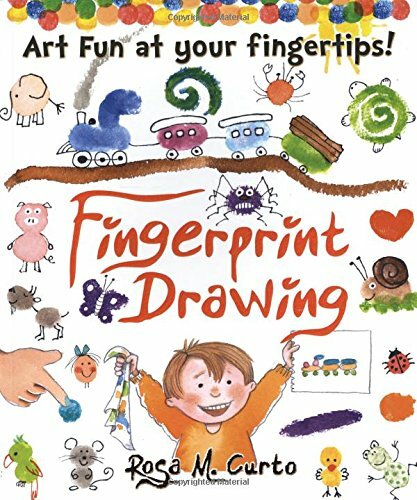 Invite the kids to draw and/or use their fingertips and thumbs to make fingerprint art and thumbprint art that can be used to make art necklaces or fingerprint art magnets. 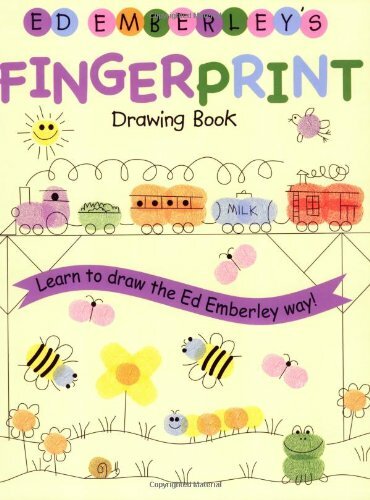 Use any of the easy art ideas listed above to create fingerprint and or thumbprint art! 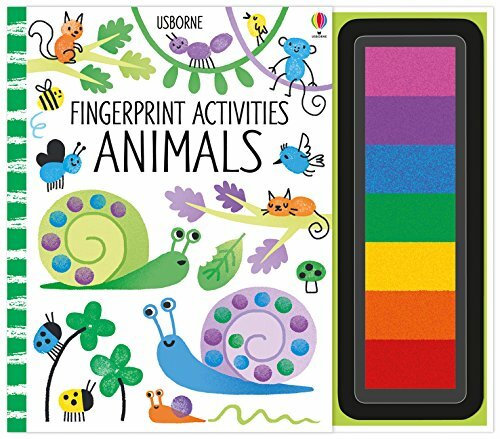 Play with the glass cabochons to see which shape will fit over the fingerprint artwork you have created. Place a drop of Mod Podge on the back (flat side) of a glass cabochon and place it on the art as shown in the video to glue it in place. Use a pair of small scissors to trim and cut away paper around the glass cabochon for the necklace. It doesn’t need to be perfect. The paper will pull slightly away from the glass cabochon when you cut it off. 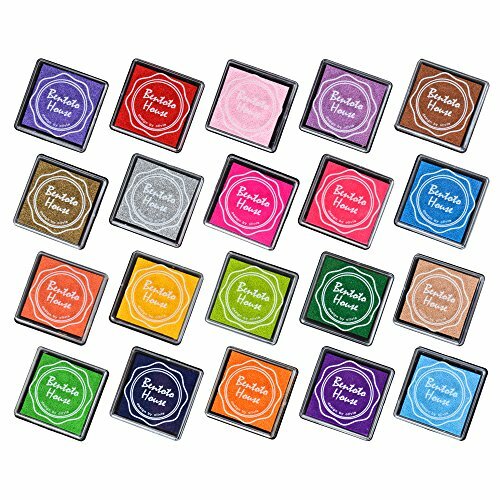 Gently massage the back of each cabochon to press the paper with the fingerprint art back onto the cabochon. You may need to place a small drop of Mod Podge under the paper if it pulled away too much to glue it back down. Most of the time you will not need to do this. Simply massaging the paper on the back of the cabochon works fine. If you use a tiny bit more of Mod Podge, you do not need to wait for it to dry before moving on to the next step. Use Diamond Glaze Adhesive to glue the glass cabochon into a pendant tray of the same shape. Either place the adhesive into the pendant tray or directly onto the paper on the back of the glass cabochon. Both ways are just as easy and work fine. Thread a necklace through the loop of the fingerprint art pendant to finish your fingerprint art necklace. Ready-made options can be found below. 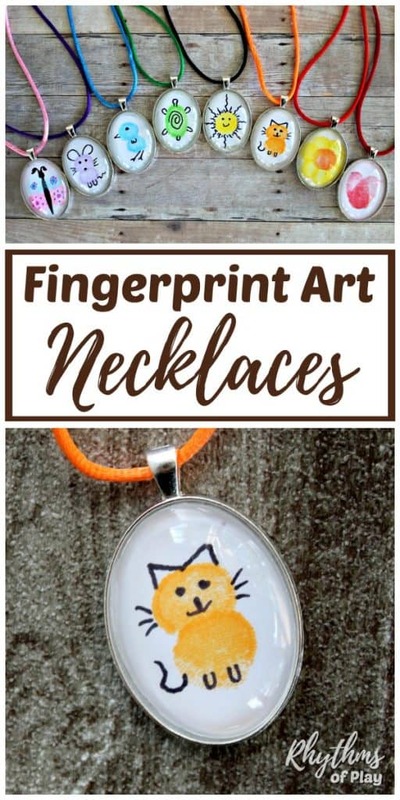 Make some fingerprint art necklaces for an easy homemade gift idea that kids and adults of all ages can make! 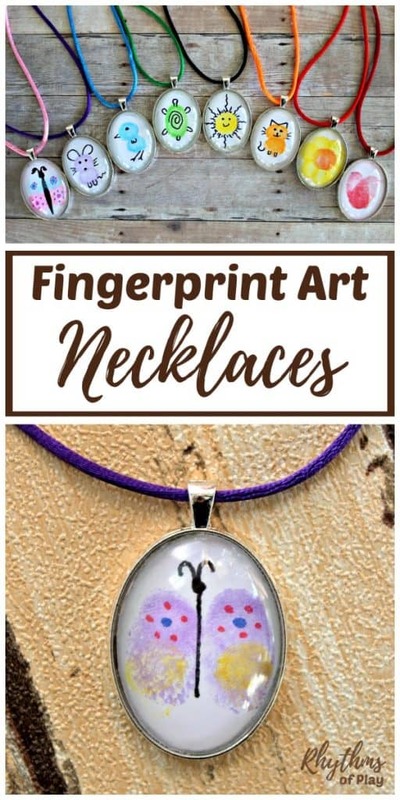 DIY Fingerprint art and thumbprint art made into a necklace, keychain or backpack charm, is an easy homemade gift idea that Mom, dad, and the grandparents’ LOVE! Don’t forget to pop over to check out all of the other beautiful gift ideas kids can make. For more art and craft ideas for kids click on the link.